Earthenware Ribbed Roaster White 9.5 X 9.5ins..
0.35 litre Earthenware Oval Eared Dish in whi..
0.2 litre Earthenware Ramekin in white. 4" di..
0.75 litre Rectangular Earthenware Roaster. 9..
Rectangular Glass Roaster 1.0L ..
2.5 litre Rectangular Glass Roaster. 13.5" x ..
2 litre Glass Round Casserole with lid. 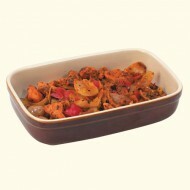 ..
1 litre Glass Round Casserole with lid. 5.5" .. Round Glass Casserole Dish with lid 3L (Large..
1.7 litre Square Glass Roaster. 8.25" x 8.25"..